"Japan is still struggling to come out of the recent series of disasters that hit the country. The damage has been enormous, with about 25,000 people killed or missing, wide areas of built and natural environment ruined, disruption in industries, logistics, transportations and an economic impact that will be felt for long afterwards. It is exactly the extent of these events that makes extremely important, now more than ever, to debate the rationale upon which our communities are built. A different approach and expertise is needed to work out solutions that can help in future disasters elsewhere in the world. The theme of postponed AAST international workshop is extended to this issue. We will try to develop possible solutions with wood as natural material for sustainable environment and with algorithmic programs that can help the designer to explore new tectonics and to generate new environments. 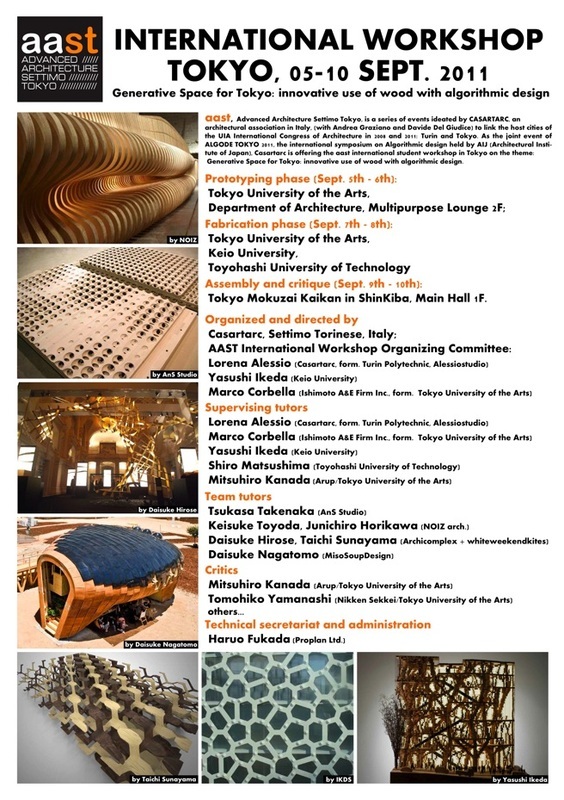 Digital fabrication processes such as CNC or laser cutting can deal with extremely complicated and various but algorithmically controlled work, making it possible to use Japanese traditional materials with rapid and sustainable architectural technology in innovative ways. The process of the work should be such that the final works will fit into the “mobile culture” that is also peculiar to Japanese architecture: space defined by the presence (or absence) and position of movable elements. Such space devices, to be realized through the assembly of smaller wooden elements, should therefore be engineered in way to be easily disassembled, packed, transported and re-assembled. - FLEXIBLE, MOVABLE, FOLDABLE: traditional Japanese concepts for contemporary emergency"
The original schedule remained more or less invariated with the online phase 1 lasting about one month and phase 2 and 3 concentrated in one week in Tokyo. The scope and method of the "online phase" was reviewed to allow more time for software training and, above all, to allow each single student to produce initially an individual idea and project instead of collaborating to a common model from the start. The design review stage was also upgraded to a separate phase and expanded to include the prototyping of all individual projects with small scale paper models by using laser cutters. Each student was required to make a powerpoint presentation of his individual project and undergo a review by tutors and team members. Each team was then required to select one project out of those produced by the team members or to merge the ideas of more individual projects into one common project for final fabrication. In this way the program was streamlined and the students gained further motivation, by realizing a prototype of their own individual model, to contribute actively to a common final project. Teamworks remained as a virtual environment where to collect the model data of the teams. Keio University Fujisawa Campus in Kanagawa prefecture, Toyohashi University of Technology in Aichi prefecture and Tokyo University of the Arts in Tokyo. The Directors, after the experience of the disaster, wanted to avoid long travels by the students. Arrangements with prof. Kanada, who kindly set up a studio space at the Tokyo University of the Arts, allowed most of the students to remain in Tokyo while only two tutors and some assistants went to the fabrication sites in the other campuses. During the fabrication phase, an additional fabrication site has also been quickly set up by prof. Ikeda at a construction site in Shin Kiba, very close to the Mokuzai Kaikan that was scheduled to be the space for the final assembly and critic. The final presentations included short animations of the models virtually placed in the city of Sendai, in the region hit by the Earthquake, reconstructed in Virtual Reality by one of AAST sponsors.